Installing a new tile floor can transform the look and feel of any room in the home. Whether you use a soft floor covering like vinyl, or a more traditional covering like ceramic, a tile floor is absolutely doable for even the most novice do-it-yourselfer. 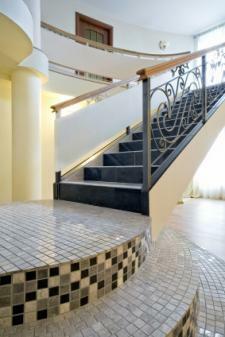 Each type of floor tile requires a different type or style of installation. Following the right procedure for your tile can make the difference between a success and a failed project. Each of these tiles installs similarly despite their difference in makeup and appearance. LovetoKnow's article How to Install Stone Floor Tiles walks you through the special needs of stone tiles and helps you get the project done, from laying and blending to sealing and grouting. Ceramic tiles are clay-based tiles that have a hard glaze covering. They come in a multitude of shapes, sizes and finishes, but they all install the same way. Installing Ceramic Floor Tiles gives step-by-step instructions for installing any ceramic tile floor covering. Vinyl tiles install completely differently than ceramic, stone or other hard flooring materials. They also cut and grout differently as well. Installing Vinyl Floor Tile takes you through the process of laying, cutting, installing and rolling your vinyl tiles to get a long-lasting installation. Mosaic tiles are tiles measuring 2-inches or smaller in size. They come in two varieties - paper-faced and mesh-mounted - and need some special handling to install. How to Install Mosaic Floor Tiles guides you through cutting, layouts and preventing problems like mortar seeping up in between the many grout joints between the tiles. 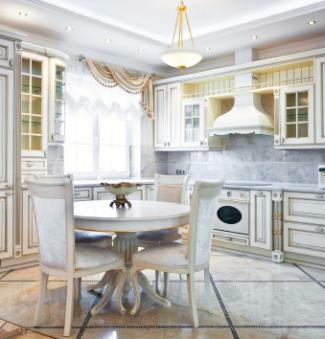 A large format tile is any type of material - stone, porcelain or ceramic - that measures 16-inches or larger in size. While for the most part they install like other tiles made of their material, their size presents special considerations. Start with an absolutely level substrate. 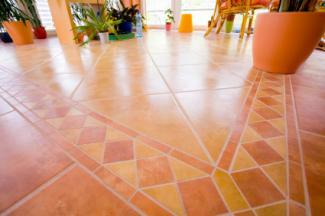 Large format tiles cannot flex or move with minor imperfections or slopes in the floor. If your substrate is out of level, use a self-leveling floor compound to ensure a flat surface to begin on. Use an appropriately sized trowel. 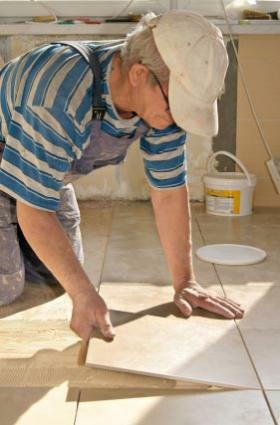 Large format tiles need a trowel sized at least a 1/2-inch by 1/2-inch square or U-notch trowel. This is to ensure there is adequate mortar on the floor. Use a no-slump mortar. A no-slump mortar is stiffer than other mortars and will allow the heavier tiles to sit properly, rather than sinking. Comb the mortar with the trowel until all the trowel marks are uniform in size. Set each tile into the mortar and beat it in with a mallet. Watch the corners of the tiles; they may rise up above the other corners. If this happens, pry up the tile and check the amount of mortar on the back. If there isn't mortar covering the entire back of the tile, spread additional mortar onto the tiles back and reset it. Beat it in until it is level. Use a level frequently to ensure that the tiles are completely flat. Let the mortar cure for at least 24 hours before grouting the tiles. A new tile floor is one project that any homeowner can tackle, regardless of whether you've tiled or done any home improvement projects before. 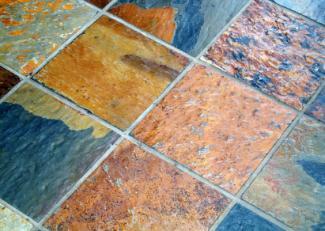 Tackle any tile floor in your home and watch your floors transform into something beautiful.